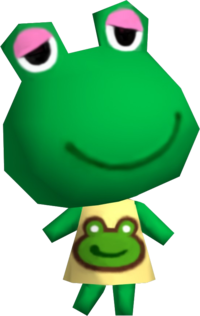 Emerald is a normal, frog villager from the Animal Crossing series, making her only appearance in Animal Crossing. She got her name from the gemstone, emerald, because emerald is green. Her catchphrase is an onomanopoea for a jumping sound, jumping being a common behavior of frogs. Emerald is a green frog with pink eyelids. She initially wears a Frog Shirt. Her eyes appear half closed, looking like she is sleepy, paralleling to the lazy personality, the male counterpart of hers which is normal. Below is a brief description of the normal personality. For more information, click here. Emerald is a normal villager. She is often very kind towards other villagers and even the player. She will always ask questions and loves being out and about. She is mostly seen in the sun with a watering can. Emerald loves flowers. She likes staying in the sun. She is barely in her house, except at night. Emerald's name might confuse players into thinking she is a snooty villager rather than normal. Emerald just loves tongue twisters. Her favorite one is "Susie and Sam sell seashells down by the seashore." And if she bumps into you, she'll probably ask you to say it 10 times fast, so be prepared! The e-Reader card for K.K. Chorale, which features Emerald. Spanish Espe Derivative of the name "Esperanza," meaning "hope"
Modified on March 4, 2019, at 20:05.